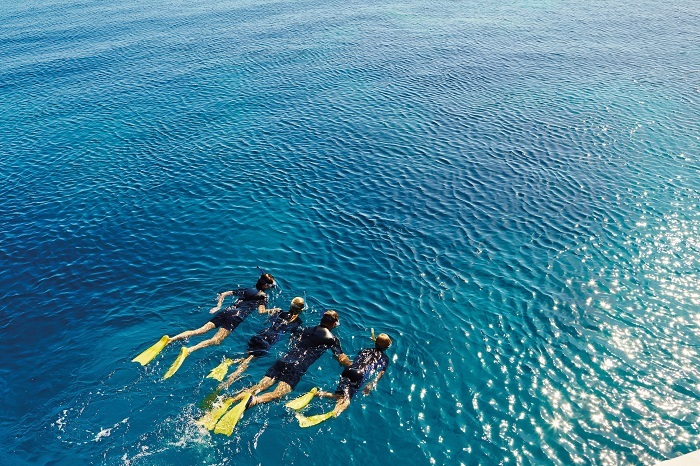 The Great Barrier Reef Cruise Deluxe takes you to paradise and gives you the chance to explore the mesmerising underwater world of this natural wonder. We'll visit two reef sites during the day, with your snorkelling equipment, one complimentary certified or beginner dive, a glass bottom boat tour, and more all included in your tour price. 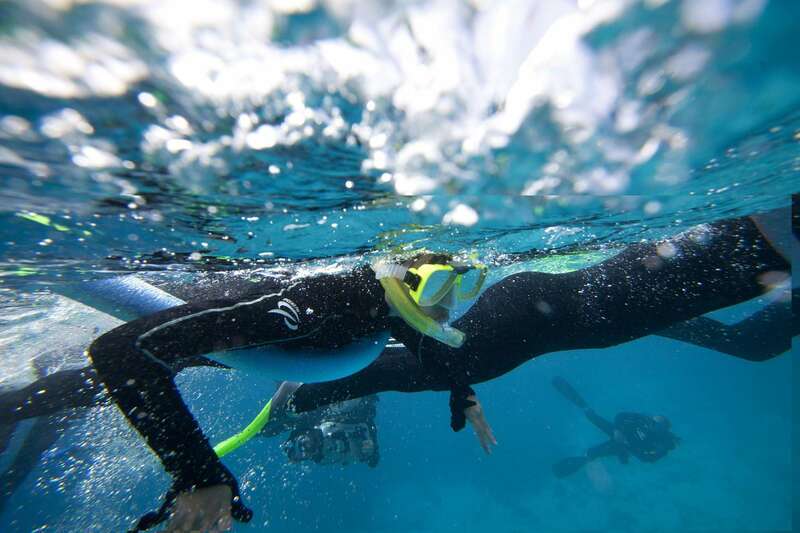 Throughout the day, you’ll have the chance to try your hand at scuba diving and snorkelling, as well as chill out and relax on deck with delicious Aussie food. Please note: various factors may impact your ability to dive including if you are flying within 24 hours of the cruise and some medical conditions. 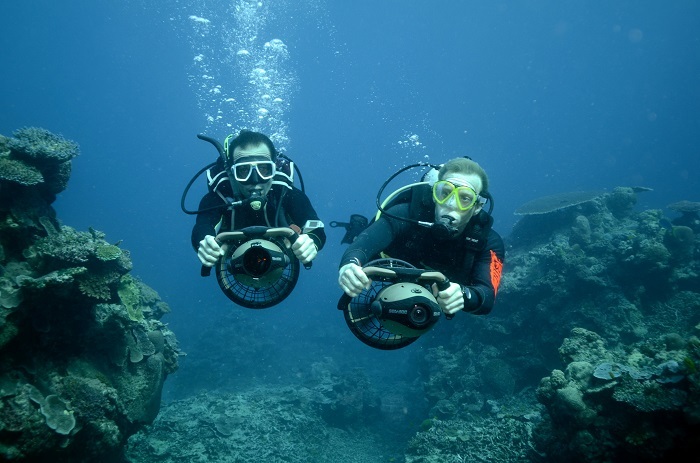 All divers are required to fill out a questionnaire before they are cleared to dive. Please view the questionnaire here and discuss with us anything that may prevent you from diving before you book. The day starts at 8:00am where we’ll board the boat from Cairns. 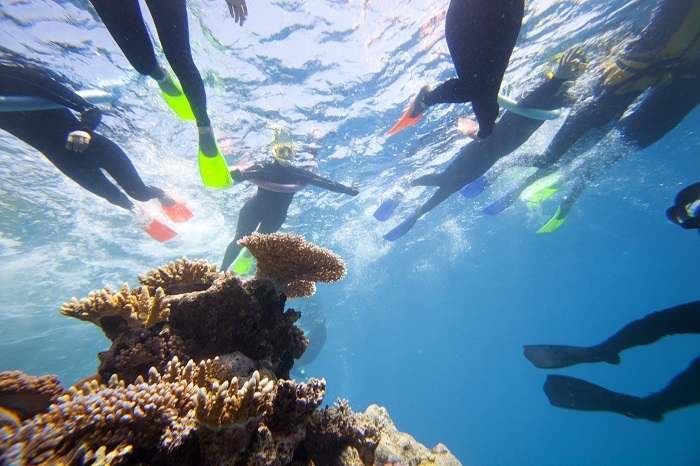 Before we set off, you’ll have a quick briefing and snorkelling demonstration so you can get stuck straight in when we arrive at our first reef. As we make our way to the first reef, you can tuck into a mouth-watering BBQ breakfast to fuel up for the day. When we arrive at the first reef, you’ll have the chance to go on a glass bottom boat ride or dip below the water’s surface and do some scuba diving. The reefs we visit will depend on the weather, but we’ll either visit Hastings Reef, Breaking Patches Reef, Saxon Reef, Norman Reef, or Jorgensen Patch. 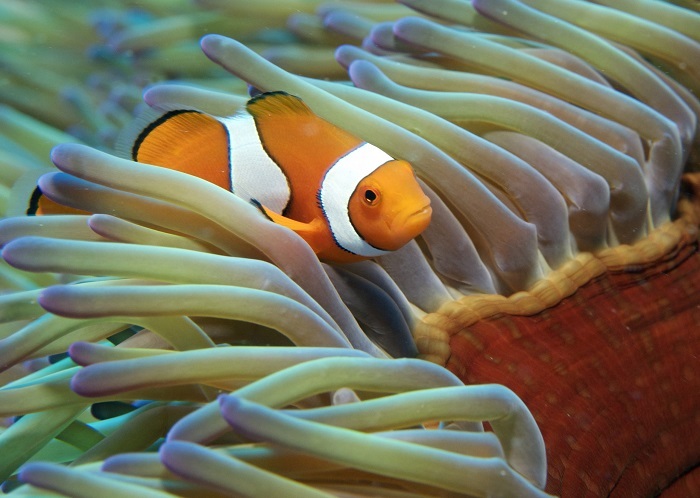 All of these spots boast ideal diving conditions and a unique set of marine life. After your first dive, we’ll tuck into a buffet lunch and you’ll have ample time to soak up the views of the reef and relax on deck. Then we’ll make our way to our afternoon reef location, where you can once more dabble in some diving and get to know the underwater world. If diving isn’t your thing, you can either go for a swim, snorkel or simply sit on deck and soak up some rays. 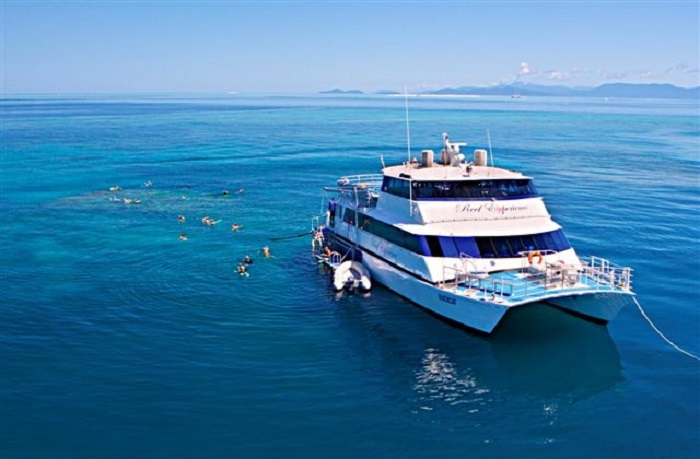 On the way back to Cairns, you can tuck into complimentary wine, cheese, biscuits, and fruit platters, as we soak up the last of the Great Barrier Reef. We’ll arrive back in Cairns at about 4.30pm. 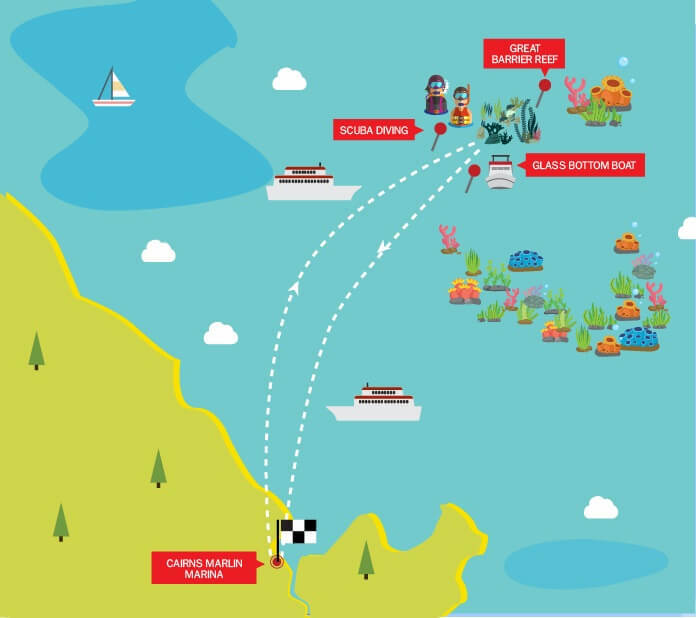 Please make your way to the A-Finger at the Marina and locate the Reef Experience boat for boarding. The address is 1 Spence Street Cairns. We can arrange bus transfers from most hotels and hostels in Cairns and Northern Beaches. If you cannot see your hotel as an option for pickup when making your booking, please contact us to advise of your nearest pickup location. We cannot pickup from residential addresses. Please note that bus transfers from Northern Beaches ($22 per person) are payable in cash on board.